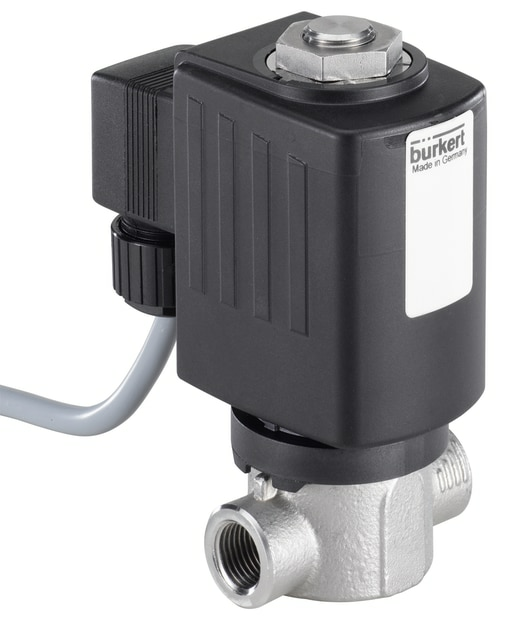 In addition to the ceramic ball seal, the material used for the seat of the solenoid valve is highly temperature-resistant polyether ether ketone (PEEK). The hardness and chemical resistance of this material fulfil the high requirements with respect to the sealing properties of the solenoid valve. The use of stainless steel and a laser welded plunger guide tube provides high pressure resistance (5 times the nominal pressure) and a low leakage. The valve is offered in a direct current version. For devices with alternating current, a rectifier connector socket is included in the standard scope of delivery. Typical applications the universal type 6027 valve are critical gases and fluids. The high-pressure version offers solutions for the construction of test rigs. One example for this would be filling systems for air conditioners in the automotive industry. This application is highly relevant, since the EU has defined new limits for the emission of climate-damaging coolants; starting in 2017, air conditioners in new cars can be filled only with coolants having a relatively low global warming potential (below 150). In addition to test benches, the new high-pressure valve is also suitable for gas applications, where the use of sliding rings reduces abrasion.